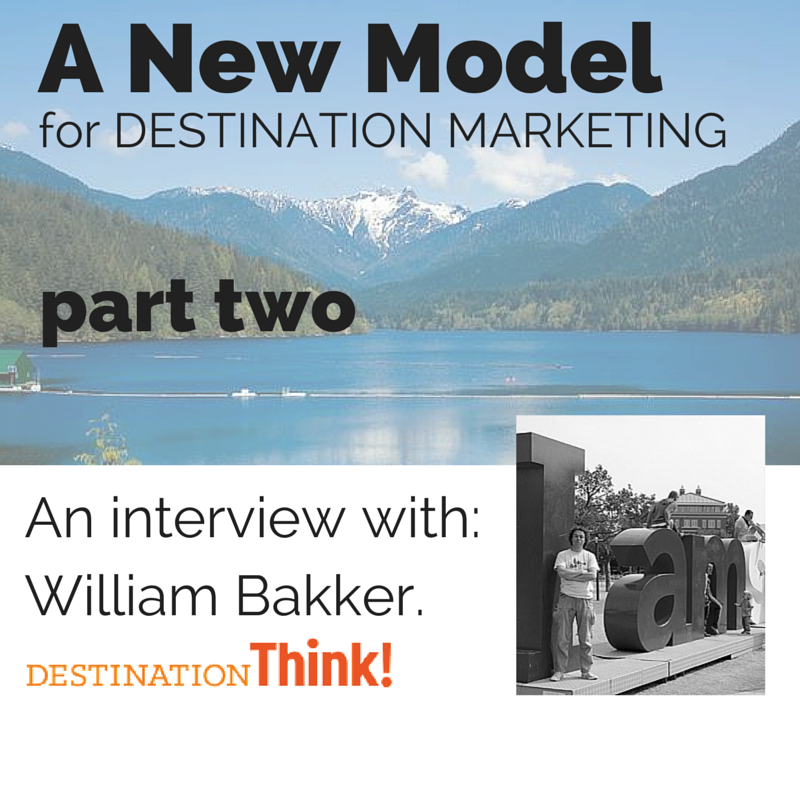 William Bakker is a veteran destination marketer, with 11 years of experience working at Destination British Columbia under his belt. Today, he leads Destination Think! 's strategy team and has worked with hundreds of destination marketing organizations around the world. Destination Think is a strategic consultancy and digital marketing agency with offices in Vancouver, Amsterdam and Sydney (plus four satellite offices in the US and Toronto). William is a highly sought-after keynote speaker and writes his own blog about leadership, marketing, travel and at DestinationThink.com. His observations, thoughts and conclusions shape the way Destination Think! help destination marketers thrive in the 21st century. Here's part two of the recent interview he gave me. Destination Think! has created its “Destination Management and Marketing Model.” Can you describe what it is and how destinations can use it? We worked on this for a very long time, and it’s a result of our journey as skilled individuals and within our company. And it’s really where our global presence has really paid off. The model incorporates everything a DMO does in a way you can wrap your head around and shows how all the pieces fit together. The nice thing about the model is that it works on a very strategic, but also tactical, level. We use it to help our clients create their corporate strategy but also to design campaigns with specific objectives. It’s very flexible. I won’t go into the details of the model itself because we’ve started a marathon blog series where we explain the model and will dive into the details. We’re almost a dozen posts in, so I encourage people to read it on our corporate blog. As part of our model, we have also created a benchmarking tool. We rank about 30 categories of DMO activities from 1 to 5. We use it internally with clients to help our team quickly understand where a client is at in different areas of the business. And recently we’ve started producing it in a formal benchmarking assessment so clients can use it internally as well for strategic planning. The benchmarking tool is the most effective way to assist in creating a multi-year roadmap for the organization. When you overlay your corporate strategy, you can see the areas of the business that need to move forward. And it communicates this very effectively with stakeholders as well. What are some of the best ways a DMO can educate its team members, get inspiration and solve its challenges? Part of the transition is a refocus and building new capabilities. That includes building new skillsets amongst team members, but also removing some of the fear of what they don’t understand. Before you understand what skills and capabilities you need, you need to understand where you currently are. We have a few tactical audits we conduct to help our clients understand where they’re at and where they need to improve. It’s extremely practical. Presenting an audit is one of the best things to do. People learn a ton and get really excited. Based on the audit, we often recommend an education plan. We used to run education workshops. People loved them. But it was hard to get people to where they need to be in a day. You can only take in so much information, and people tended to fall back into their old ways. When we started to train and then coach people, is when we really started to see results. You learn over time using real examples and have someone to collaborate with and ask questions of on a regular basis. Learning from and connecting with colleagues is also important. We run our #SoMeT conferences in the US, Europe and Australia where DMOs share their learning about reinventing their DMO. It’s a very inspirational experience for people, including at the leadership, C-suite level. You walk away with new ideas, a chance to see what your competitors and colleagues are doing, as well as expand your network. And finally, if a DMO has a limited budget, what is the one thing they should focus their efforts on? I wish there was a magic bullet, but there isn’t. Every DMO is different. Too often people chase the latest marketing trend but for what purpose? Most DMOs are already stretched, so you need to think about what to stop before you think about what else to do. I think understanding where you currently are and having a strategy is important to create focus. If a client asks me that question at the start of our relationship, I would tell them that our assessment is the best place to begin. Everything else will flow from there. Join the LinkedIn group A New Model for Destination Marketing to gain more insights into how DMOs across the world are facing up to the challenges of marketing today.